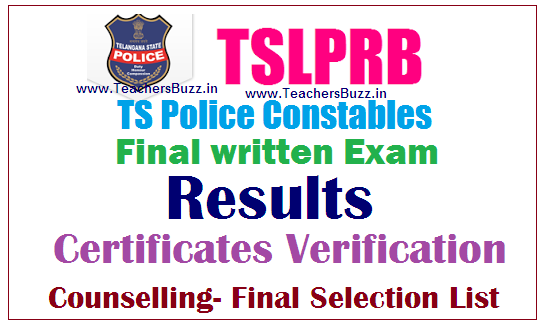 TSLPRB TS Police Constable Mains Results 2019,Certificates Verification, Counselling, Final Selection List @tslprb.in. TS Police Constable Mains Results 2019,Certificates Verification. Telangana Police Constable Provisinal Selection List @tslprb.in , PCIVIL/ AR/ SARCPL/ TSSP/ SPF/ FIREMEN Venue wise list of selected candidates who should report before SP/CP for submitting original certificates & attestation formsTelangana Police Constable Provisinal Selection List @tslprb.in, TS Police Constable, Firemen Mains/FWE Results 2019, TS Police Constable Mains Result 2019,Telangana Police Constable Cut Off Marks/Merit List @tslprb.in. Telangana Police Constable results 2019 Download results,Marks Expected Cut Off Marks @tslprb.in. TS Police Constables recruitment mains/ final written Examination results with marks Download @ www.tslprb.in .Telangana Police Constable results 2019 Download . TSLPRB-Telangana Police Constable final written Examination key 2019 Download, TS Police Constables final written Examination results. Telangana State Level Police Recruitment Board www.tslprb.in , TSLPRB TS Police Constable Recruitment SCT Police Constables (Civil/AR/SARCPL/TSSP) in Police department, Constables (Men) in SPF and Firemen in TS Disaster Response and Fire Services department final written Examination results, cut off marks, details are given here. TSLPRB had issued a notification on 31-05-2018 for the recruitment of SCT Police Constables (Civil/AR/SAR/TSSP) in Police department, Constables (Men) in SPF and Firemen in TS Disaster Response and Fire Services department. The Preliminary Written Tests and the Physical Measurements, Physical Efficiency Tests for the Recruitment of SCT PCs (Civil/AR/SAR/TSSP) in Police department, Constables (Men) in SPF Department and Firemen in TS Disaster Response and Fire Services department and SCT PCs (Communications) were completed . All the candidates who have qualified in the Preliminary Written Test have been appeared for Physical measurements Test/ Physical Efficiency Test at the designated venues in the district/cities and the results were declared. All the qualified candidates in the above have to appear for Final Written Examination. The Final Written Examination is conducted on in the State.Telangana Police Constable Mains Results released Declared soon. The Telangana State Level Police Recruitment Board (TSLPRB) invites Applications through ONLINE mode only in the prescribed proforma which will be made available on Website (www.tslprb.in) from 09-06-2018 to 30-06-2018for recruitment to the following Posts. The Final Written Examination for the recruitment of SCT PCs (Civil/AR/SAR/TSSP) in Police dept., Constables in SPF dept. and Firemen in TS Disaster Response & Fire Services dept. conducted in all the districts of the Telangana State the candidates attended the above Final Written Examination throughout State. TS PoliceConstable Written Exam Telangana State Level Police Recruitment Board is declared the Result/Marks Sheet/ Final Merit List/ Select list at the website of the Recruitment board . Candidates Can download results from here. The Telangana State Level Police Recruitment Board, TSLPRB has released the TS Police Constable result 2019 on its official website - tslprb.in. The candidates who had appeared for the TS Police Constable exam 2019 are visit the official website of the Board to check their result. 3.The Results Page will be displayed. a) The notification for 16,925 vacancies of SCT PCs Civil and / or equivalent Posts was released by TSLPRB on May 31, 2019.
b) The preliminary examination for TS Police Constable was conducted at 966 Examination Centres located in 40 Places on September 30, 2019.
c) The answer keys were released on October 5 and candidates allowed to raise objections, if any, till 5:00 pm on October 8, 2019.
d) As many as 4.49 lakh candidates have appeared for the SCT and police constable examination conducted this year. The TS Police Constable exam 2019 was conducted on September 30, 2019. The venues where the candidates have to report are also available with Registration Numbers in website of TSLPRB, Hyderabad. All the candidates are requested to follow the above schedule. The candidates shall download intimation letters by providing the following details and produce the same to the CP/SP concerned. If any candidate fails to report for submitting Attestation Forms or to attend medical examination, his / her selection will result in cancellation. SCT PCs (Civil/AR) (Men & Women), SCT PCs (SAR CPL/TSSP) (Men), Constables (Men) in SPF and Firemen in TS DR & Fire Services department has been uploaded, District / Battalion / Unit wise in the TSLPRB website (www.tslprb.in). 2. The candidates may see the District / Battalion / Unit to which they are selected. One cut off rank of one district cannot be used as the cut off rank of another district or Battalion or Post. Each district, Social category (BC/SC/ST/ABO-ST) and also Special Category (NCC, MSP, CPP, CDI, HG) and women will have different cut offs. ONLINE CHALLENGE OPTION GIVEN TO THE CANDIDATES. Candidates, who are willing to submit representations about any discrepancy in selection, may submit representations online The details regarding process of challenge option will be put in the website www.tslprb.in . Ranks of Civil, AR & TSSP are different. ➧Civil rank is based on FWE marks. ➧AR rank is based on Driving Licence marks + FWE+ Physical Efficiency Test. Please do not compare with FWE marks alone for posts other than CIVIL. All responsible people /institutions are requested not to circulate news items without verification, which may lead to frustration of youth.